Taking back the cheese drawer. Taking back my life. I love cheese. I love all kinds of cheese. Stinky cheese, expensive cheese, squirt cheese (which isn’t really even cheese). 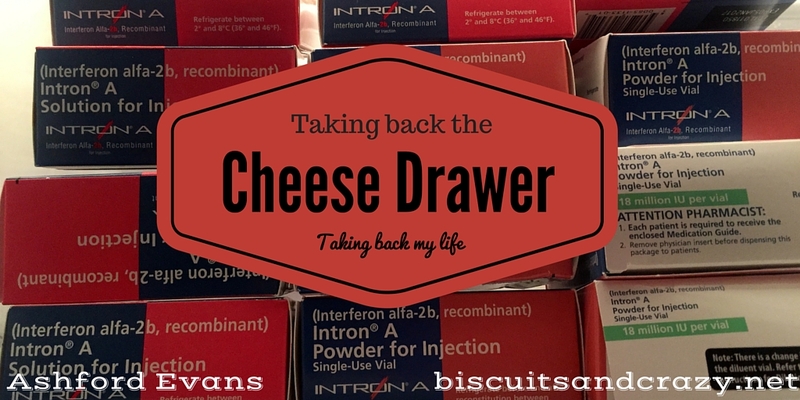 Six months ago I emptied out my cheese drawer and filled it with boxes of chemotherapy. A drug that I was to inject into my husband’s belly 3 times a week. I hate chemotherapy. I hate the side effects, I hate the emotions, I hate the mental battle it is to inject someone you love with something you know darn well is poisonous. I hate watching him suffer. So many of you have been following our story over the past several months. You know that 8 months ago our world got rocked when the hubs was diagnosed with Stage 3 Melanoma. (If you’re new here you can catch up on our journey by reading this post.) So many of you have reached out to me asking for an update. So tonight is a monumental night for us and I wanted to share. We had a brutal battle through chemo that was supposed to last 52 weeks. He lasted 7 weeks before the neurological complications of the poison coursing through his brain made the doctors reconsider the risk/benefits of continuing with therapy. On November 30 they ceased his treatment. Since then we have been picking up the pieces of our lives. Reentering society after a diagnosis and treatment regimen has proven difficult. You see when you are actually battling the demons you draw on strength and reserve you never knew you had. You power through. You do what’s necessary. When the dust settled is when it got really hard for me. I had yet to process any of the emotions and any of the events and began reliving things. I quit sleeping and my already high anxiety skyrocketed. It was like walking around in someone else’s body. We began going to counseling once he was well enough to leave the house and we both sought help from our doctors in the form of prescriptions. Now, 3 and a half months after the last dose of chemo I can finally feel the blood returning to my limbs. I am finally beginning to feel like a real person again rather than a puppet jerkily going through the motions that someone else demands of me. When we stopped the chemo we were unsure of whether or not we would ever have to start again. So since October every time I open my refrigerator those tiny little vials of hell stared back at me from the cheese drawer. Every drink, every snack, every time it would take me back. They stared at me taunting me. Reminding me. They brought back the fear, the stress, the terribleness of it all. Well today I am taking back the damn cheese drawer. The decision is final that he will not resume treatment and now I can discard this ugly part of my life. As much as I want to take a hammer to every single vial and shatter them with all of my anger I know there is a better solution. I called our infusion nurse at the cancer center. As we thought this was a long term regimen we have several months of drug on hand and cancer drugs are expensive. Our nurse reached out to a patient on the same medication who had not been showing up to his last few appointments. She discovered that he wasn’t coming because he simply couldn’t afford his treatment anymore. A dire situation for anyone with a diagnosis like this. So tonight, I’m cleaning out the cheese drawer. Tomorrow I will drive the medication down to the cancer center and donate it to this anonymous person. And then? Then I will go to the grocery store and buy every block of stinky cheese I can find. And maybe a bottle of wine too. This is not the end. He is still at a high chance of recurrence and he didn’t finish the treatment schedule. This is something we will face every day for the rest of our lives. But it is a step forward. A step away. And tomorrow I can open the refrigerator without those ugly boxes staring back at me. Continuing to pray for David, you, and your precious family. Cheese is beautiful and so are you! I hate cancer, but I love this story. I am glad you could at least bless someone else in the same situation.